Pictures from this year's holiday party at the Mayfair Farms are now available on Flickr, thanks to Nancy Webster. Don't forget to send in your check for the annual New Jersey World War II Book Club Holiday Party at Mayfair Farms on December 14. Cocktails start being served at 6:30 p.m. This year's dinner will include a lecture by Sarah Kaminsky, who will be arriving from France to speak about her book, A Forger's Life based on the life of Adolfo Kaminsky, a master forger for the French Resistance during World War II. 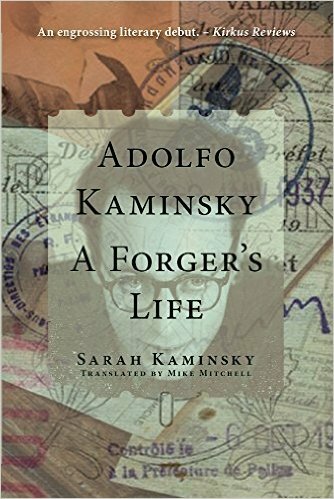 Our guest speaker will be Sarah Kaminsky, lecturing on her book, Adolfo Kaminsky, A Forger's Life. She is coming from France to lecture here in New Jersey, and her father was one of the most important forgers for the French Resistance in WWII. Dr. Fogelsong, who was previously scheduled to speak at our annual celebration, has consented to lecture on February 8, 2017. The author of Shot from the Sky: American POW's in Switzerland will return to the Book Club to discuss her latest book about the American flyers shot down and interned by neutral Switzerland during World War II. "Harry S. Truman and the Origins of the Cold War." REMINDER: Bonus lecture at the Millburn Library on November 7 at 7 p.m. - Michael Tougias, author of The Finest Hours. A good group of Book Club members turned out for James Duffy's presentation tonight on MacArthur's New Guinea campaign before returning home to the final debate of this year's Presidential election season. And what a wonderful presentation it was! 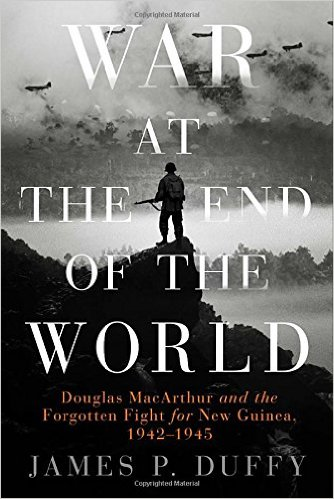 Mr. Duffy spoke about his latest book, War at the End of the World: Douglas MacArthur and the Forgotten Fight For New Guinea, 1942-1945 , a subject most of us know little about. The Japanese had invaded New Guinea in 1942 and it was General MacArthur's task to get it back and then return to the Philippines. The geography and climate of New Guinea itself was as challenging an opponent as were the Japanese. By September, 1944 MacArthur had accomplished his mission, successfully defeating the Japanese and incurring large Japanese losses, while keeping American casualties to a minimum. Pictures of the terrain, the soldiers ankle-deep in mud, made it clear to the audience as to just how difficult it was to attain this victory. Bonus Lecture: Monday, November 7, 7 p.m.
Friends of the Millburn Library present Michael Tougias, author of The Finest Hours, who will discuss his latest book So Close to Home, the true story of an American family's fight for survival from a U-boat attack during World War II. The presentation will be held at the Millburn Public Library. Karen Huntsberger will discuss her latest book, Waiting for Peace, which tells the true story of Richard Berkey, a combat medic who served with the 68th Armored Infantry Battalion in France and Germany. His story is told through the voices of the people who lived through the momentous events of the war. Mark your calendars for our annual Holiday Party, held at the Mayfair Arms, at which Dr. Foglesong will speak on "Harry S. Truman and the Origins of the Cold War." We have great series of lectures lined up for this fall, including a bonus lecture on Monday, November 7, 2016, courtesy of Friends of the Millburn Library. Any extra donations are appreciated. I look forward to sharing a great season with you. September 14: Paul Goldhersz on "From Lodz to Fairlawn: My Journey of Luck and Survival. Mr. Goldhersz is a holocaust survivor indwell walkabout his life as written in his book. October 19: James P. Duffy is the author of eighteen books. 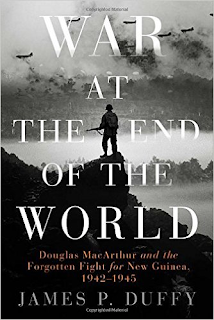 Many of these books are on World War II subjects, including his most recent, War at the End of the World, Douglas MacArthur and the Forgotten Fight for New Guinea, 1942-1945. His previous World War II books include The Sinking of the Laconia and the U-Boat War, Disaster in the Mid-Atlantic; Target: America, Hitler’s Plan to Attack the United States; Hitler's Secret Pirate Fleet, The Deadliest Ships of World War II; Target Hitler: The Plots to Kill Adolf Hitler; Hitler Slept Late: And Other Blunders That Cost Him the War. November 7 (Monday) Bonus Lecture: The Friends of the Millburn Library will be hosting a book/author event tentatively set for Monday evening, November 7 at the Library. The author is Michael J. Tougias and his latest book is So Close To Home; a true story of an American family’s survival after their freighter, the Heredia, is torpedoed by a German U-Boat about 50 miles off the coast of New Orleans. Mike has written many books, one of which is The Finest Hours, which was also made into a movie by Disney. November 16: Karen Huntsberger on her book, Waiting for Peace, which tells the true story of Richard Berkey, a combat medic who served with the 68th Armored Infantry Battalion in France and Germany. His story is told through the voices of the people who lived through the momentous events of the war. The book brings together hundreds of original sources: Richard’s secret war journal, his letters to family and friends, and the letters sent to him by his parents, brothers and sisters. The letters of Richard's mother are especially powerful as they speak of home, love and encouragement and share news of three sons and a daughter serving their country. Other sources include letters from friends who were in the service, Army Morning Reports and Unit Histories. Extensive footnotes, period photos and maps provide background and context for readers. 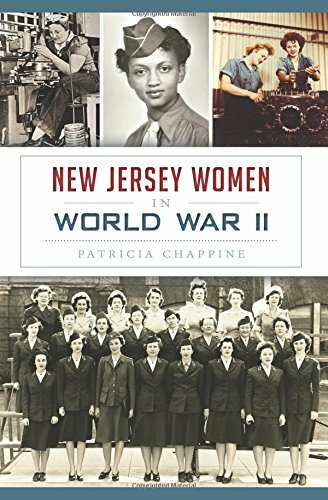 December 14: The lecture by Dr. David S. Foglesong will coincide with the NJWW2 Book Club Holiday party at Mayfair Farms. Dr. Foglesong will speak on "Harry S. Truman and the Origins of the Cold War." The talk will detail President Truman's humility and quiet courage, which helped him make the tough decisions that defined his presidency. During his time in office, President Truman desegregated the military, led the U.S. into the Korean War, created the Marshall Plan to rebuild post- World War II Europe, and made the decision to drop the atom bomb on the Japanese. January 11, 2017: Cathryn Prince other book Shot From the Sky: American POW's in Switzerland. Shot from the Sky uncovers one of the great, dark secrets of World War II: neutral Switzerland shot and forced down U.S. aircraft entering Swiss airspace and imprisoned the survivors in internment camps, detaining more than a thousand American flyers between 1943 and the war’s end. While conditions at the camps were adequate and humane for internees who obeyed their captors’ orders, the experience was far different for those who attempted to escape. They were held in special penitentiary camps in conditions as bad as those in some prisoner-of-war camps in Nazi Germany. Ironically, the Geneva Accords at the time did not apply to prisoners held in neutral countries, so better treatment could not be demanded. When the war ended in Europe, sixty-one Americans lay buried in a small village cemetery near Bern. Operation Anthropoid Now a Film! 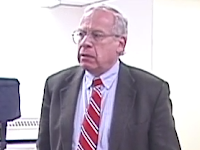 Back in May, 2015 Pat Shuber lectured on the attempted assassination of Reinhold Heydrich. The story is now a major film (see the teaser below). Mr. Shuber's presentation was fascinating. Hopefully the film will be equally so. Next lecture is on May 11, 7 p.m. - Nick Bellantoni will present MysteryQuest—Behind the Scenes of The History Channel’s "Hitler’s Escape” THIS LECTURE IS NOT TO BE MISSED! On June 8, Bob Max will discuss his capture and treatment as a slave laborer for the Nazis. The cost will be $100 per person, and includes wine and hors d'oeuvres, and a copy of his book. Patricia Chappine is an adjunct professor at Stockton University. She earned a bachelor’s degree in sociology and a master’s degree in Holocaust and genocide studies from Stockton University and is currently a doctoral student in the History and Culture Program at Drew University. William "Pat" Schuber's lecture on the war in Sicily and Italy during World War II is now available on YouTube. 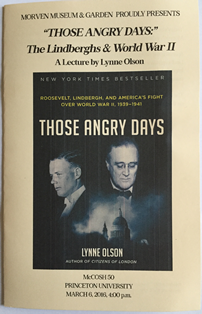 The Morven Museum & Garden presented Lynne Olson, author of Those Angry Days: Roosevelt, Lindbergh and America's Fight Over World War II, 1939-1941 at Princeton University's McCosh Hall on March 6. 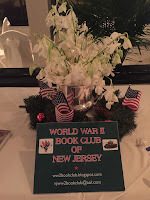 Dr. and Mrs. John McLaughlin attended, along with Dr. Richard Schonberg, President of the NJ World War II Book Club and Marie Somers, the Club's Director of Communications. McCosh Hall was almost filled to capacity as Ms. Olson explained the tense and often open conflict between the interventionists who favored America's support of Britain and the isolationists who opposed it. In Ms. Olson's latest book, these opposing views are exemplified by two of the most famous men in America, Franklin D. Roosevelt and Charles Lindbergh. Together with Ms. Olson's answers during an insightful question-and-answer period, the lecture was an informative way to spend a Sunday afternoon. A video of Dr. Jonathan Rose's presentation at the January 13, 2016 meeting, "The Literary Churchill," is now available on Youtube. The video of Del Staecker's February presentation on Sailor Man: The Troubled Life and Times of J.P. Nunnally, USN is now available on YouTube. William "Pat" Schuber will deliver a lecture on the war in Sicily and Italy during World War II in which the American and British forces encountered resistance by the Nazi troops. When the invasion commenced in Sicily (July 1943), the Italian army quickly surrendered and thereafter the American and British troops were left to deal solely with the Nazis. Churchill deemed the Italian invasion, even after the war, as a worthwhile endeavor and essentially an attack on "soft underbelly" of the Nazis. It was far from that. Ask any survivor of Sicily, Anzio or Salerno and they will dissuade you from that viewpoint rather rapidly. Stand at the Sicily-Rome cemetery where over 8,000 American servicemen are buried and you will agree with American servicemen. This was a tough struggle. General Kesselring, commander of the Nazi forces, said in his memoirs that the only way to invade Italy was to start at the top of the boot. We started at the toe and worked our way up. Rome was not taken until June 5, 1944, the day before D-Day. This is essentially the same trip taken by John McLaughlin, Rich Schonberg and Miller Bugliari in the summer of 2014. Pat Schuber covers the same battle sites. John McLaughlin heard this lecture by Pat Schuber some time in the fall of 2013 and immediately booked him for this lecture. This is a lecture that no one should miss. For those members who attended Cathryn Prince's lecture in October, 2013, you might be interested to learn that a novel has just been published based on that tragedy: Salt to the Sea by Ruta Sepetys. On the author's website, Ms. Sepetys states that Ms. Prince's book, Death in the Baltic, was "One of my research sources and a brilliant non-fiction companion for Salt to the Sea."